I don’t know when I first became aware of the forced removal and internment of Japanese-Americans from the West Coast of the United States during World War II. But I remember learning alot more about it for a paper I wrote back in 1989 when I was an undergrad at UC-Berkeley. 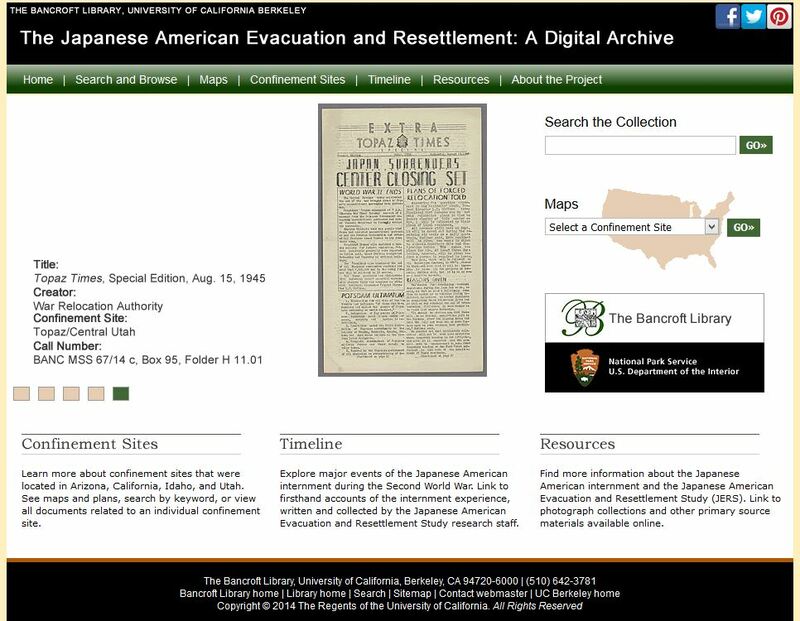 The Bancroft Library at Berkeley is a repository for a large number of primary documents that are part of what used to be called the Barnhart Catalog of Japanese Evacuation and Resettlement Documents. I will never forget sitting in the library going through box after box of letters, memos, diaries, essays, speeches, high school newspapers, and other ephemera of people living their everyday lives under extraordinary circumstances. I was transported back to a time I hardly knew existed in the United States. Screen cap of http://bancroft.berkeley.edu/collections/jais/. The materials I examined were from the Japanese Evacuation and Resettlement Study (JERS) and the War Relocation Authority (WRA). JERS was conducted by social scientists from UC-Berkeley from the time of the early evacuation until after the closing of the last relocation center. My paternal grandparents were Nisei, second generation Japanese-Americans, born in Hawaii. So my father is Sansei, also born and raised in Hawaii. He was 11 years old when the Japanese bombed Pearl Harbor. Because there was such a large population, there was no mass incarceration of Japanese-Americans in Hawaii at the time. So none of my immediate family were interned. 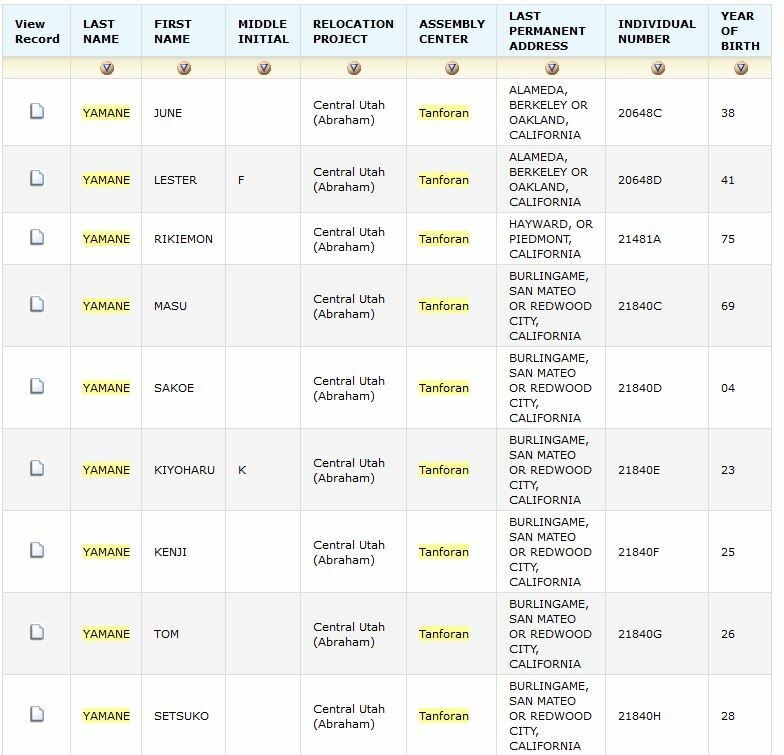 But thanks to the National Archives’ Database of Japanese American Evacuees, I was able to search for last name “Yamane” among the 109,384 evacuees listed. The search yields 179 results, including some from the San Francisco Bay Area, where I was raised. To produce the screen cap above, I added the search term “Tanforan.” When I was growing up in the Bay Area in the 1970s and 80s, Tanforan was a shopping center in the city of San Bruno. Before that, however, it was a horse race track. And, as I came to learn in my studies, it was used as an “assembly center” — a temporary jail pending the construction of the permanent internment camps. 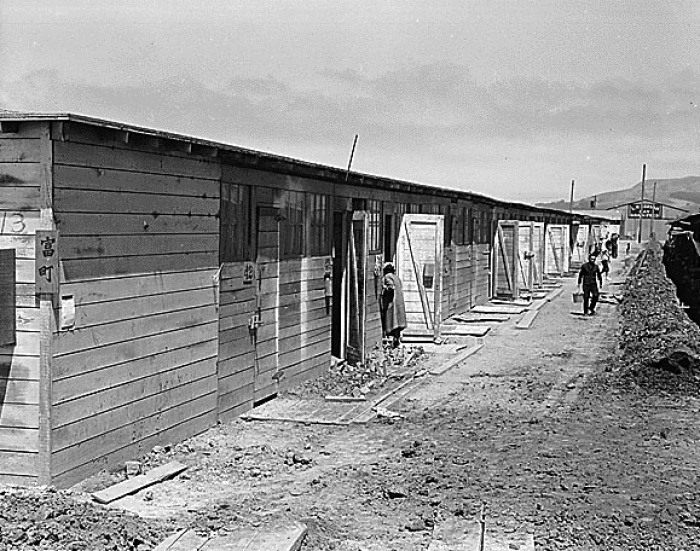 “View of barracks at Tanforan Assembly Center, California, June 16, 1942.,” Densho Encyclopedia http://encyclopedia.densho.org/sources/en-denshopd-i151-00344-1/. Even though I learned alot about the internment through my class paper, I still had alot to learn. In the summer of 1991, I worked with my father or a few weeks in Wyoming, around Worland. I remember driving along one of Wyoming’s many sparsely populated highways one day, seeing a mailbox, and noticing the name on the mailbox was Japanese. It wasn’t until we passed 2 or 3 more such mailboxes that I made the connection to the Heart Mountain Internment Camp, which was outside of Cody, Wyoming. 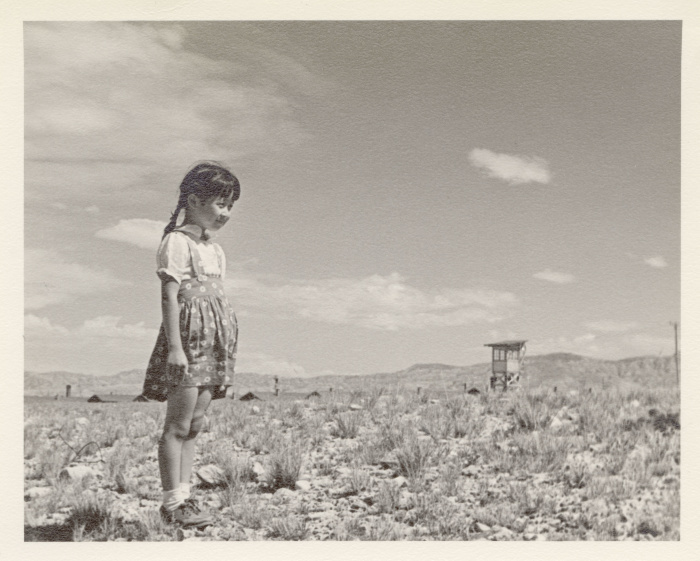 “Young girl near guard tower, May 31, 1944, Heart Mountain concentration camp, Wyoming.,” Densho Encyclopedia http://encyclopedia.densho.org/sources/en-ddr-hmwf-1-15-1/. Obviously the reality of these camps is an important part of American history, but I also think of them as part of my personal history. It is only because they lived in Hawaii rather than California that my father and his family were not rounded up and imprisoned. In addition to posting more about the history of the internment, I am also going to create a landing page and individual entries for the camps and centers that I have already visited and will visit in the future. Stay tuned.